The first 1,896 sols (Martian days) of Curiosity's traverse in Gale Crater appear as a blue line that begins at top right. During that time, the rover drove 11 miles (18 kilometers). Meanwhile, as part of their navigation duties, the rover's accelerometers were recording data that let scientists determine the strength of gravity at many points along the path. As Curiosity climbs Mount Sharp, it gets farther from the center of Mars and gravity's pull weakens very slightly. However, rover accelerometer data (gray) shows that gravity fell off less than expected. The difference between the predicted pull (dashed line) and modeled (solid line) comes from the pull of Mount Sharp itself. This let researchers estimate the rock density under the rover. When Di Bowman was making the move from Michigan to Arizona, she had found just the right home. But there was one flaw, and it was a deal-breaker. It was the start of a mission for Bowman, a professor at the Sandra Day O’Connor College of Law and the School for the Future of Innovation at Arizona State University. She began researching and discovered that child drownings are a preventable public health crisis in the United States and globally — and that the problem is particularly acute in Arizona. According to the World Health Organization, drowning is the third-leading cause of unintentional injury death globally, and the highest drowning rates are among children 1 to 4 years old. In the United States, drowning is the leading cause of unintentional death among 1- to 4-year-olds, according to the USA Swimming Foundation. And Arizona has the second-highest drowning rate in that age category, behind only Florida. There are clear divisions among socioeconomic and racial demographics. A USA Swimming Foundation study found that 79 percent of children in households with incomes less than $50,000 have little or no swimming ability. Further, 64 percent of African-American children, 45 percent of Latino children and 40 percent of Caucasian children have little or no ability to swim. Bowman is now leading a multifaceted, multipartner campaign to help safeguard all children in Arizona, especially those in the highest risk categories. The campaign is gaining momentum, focusing on better ordinances and wider access to swim lessons. But the first step was raising awareness. Bowman applied for a grant with a private foundation but was turned away, being told that it wasn’t a significant enough public health issue. She cited the statistics, underscoring Arizona’s dubious distinction of having the second-highest drowning fatality rate for children 1 to 4 years old, with 4.45 deaths per 100,000 children. And she pointed to research suggesting the numbers are even higher, and that the deaths are, for the most part, preventable and due to lack of supervision, the absence of proper barriers and adults severely overestimating the swimming ability of children. But it was to no avail. She knew there needed to be greater awareness. So she enlisted the help of experts at Phoenix Children’s Hospital and a high-profile resource within the ASU community: Sun Devils swimming and diving coach Bob Bowman, the Team USA coach who helped guide Michael Phelps to a record-breaking Olympic career. Bob Bowman is no relation to Di Bowman. In fact, the two had never before met. But when she asked for his help in producing a public service announcement, he did not hesitate. The public service announcement won a media award from the Drowning Prevention Coalition of Arizona. And it also caught the attention of the Phoenix-based Hubbard Family Swim School, who reached out to Di to partner with ASU on a multifaceted drowning prevention program designed to reduce drowning-related mortality and morbidity in Arizona generally, and in the 1- to 4-year-old range in particular. A pillar of their partnership is to better provide access to swimming lessons. 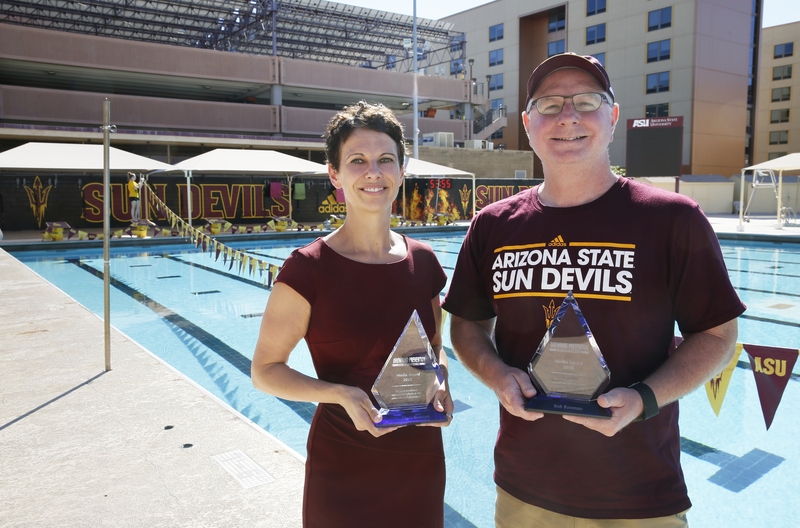 Now, they are leading efforts within ASU and Hubbard Family Swim School to partner with the city of Phoenix to build a state-of-the-art indoor swimming pool in the Maryvale section of Phoenix, an area of the city where drowning rates are especially high. “The idea is to bring a pool to the people who are more likely to drown and give them that as a resource,” said Di, who added that the facility would use the curriculum taught at the Hubbard Family Swim School locations throughout the Valley. She said Maryvale’s demographics, including greater poverty rates and a higher percentage of minority and refugee residents, correlate with higher drowning risks. Di Bowman hails from Australia, a country with a more stringent culture of pool safety. “I think it is fair to say that Australia is a nanny state when it comes to public health,” she said. “Local governments have implemented stringent laws requiring, for example, private pools to be equipped with a free-standing barrier and self-locking pool gates. And that’s complemented with a comprehensive public education campaign spearheaded by former Australian Olympic swim coach Laurie Lawrence. This collective effort to address childhood drownings appears to be a huge factor in reducing mortality and morbidity rates in Australia." And she said Australian officials are much more proactive in enforcing those regulations. She does not advocate that level of intrusiveness. But she says the evidence is undeniable that barriers around pools reduce child drownings, and she would like to persuade local governments to review — and, where necessary, revise — existing pool barrier ordinances to ensure they meet best practices. Working with ASU Law library staff and research assistants, Bowman is mapping every ordinance in Arizona, showing the correlation between laxer local ordinances and higher drowning rates.